As many readers know I've been highlighting the activities of the Fed and how those actions impact the US and the world. In the 2011 Outlook I emphasized how the exporting of inflation would cause oil and gas to go much higher and how food would also be impacted as a result. Over the last week we have seen the media blitz as Tunisia and Egyptian riots have boiled over due to poor economic conditions like high unemployment, poor wages, and the rising cost of food. Tunisia has overthrown their leadership and it appears as though Egypt will also have new leadership. The coming changes in Egypt have me wondering what is next. To assist readers, I've included a link here to Stratfor which is an organization that is made up of former intelligence officers that now sell market and world intelligence to Wall Street and other buyers. They have a very informed group that has great insight in world politics and economics. The 8 minute video is worth watching. There is a ton of great stuff in the interview, but I think the money shot here is that he says that the events in Egypt are of "towering consequence". In other words, "THIS IS BIG". The drama that unfolds there is so interesting because it unveils the conflicting US position where we support strong-men dictators while championing democracy. This is just another opportunity to see how ill prepared Obama (and Hillary Clinton) is to understand and deal with the real-world dynamics of foreign policy. The truth is that the US and Israel have implemented successfully a strategy of playing on the divisions of the people in the Middle East for many years. Think about it, we look to take advantage of the differences between Arabs and non-Arabs, and we play to the divide between Sunnis and Shiites. A homogeneous Middle East dominated by a common "democratically elected" Islamic movement is absolutely not in the best interest of the US, or probably the world. I hope that there is a skillful way for the US to continue to play this game, we absolutely need adept diplomatic leadership now. A change of leadership in Egypt probably ushers in a more overt role by the military. The border with Israel is of great concern. Remember, Egypt has played a major role in containing the Palestinians by having a "sealed" border. A government that is more sympathetic to the Palestinians could mean instability for Israel. The broader question is whether or not the spread of unrest stops in Egypt. If a change of power is made, I believe that it will incite others to attempt to try. The reality is that if new countries are swept up in the move to overthrow current leadership, things could become very nasty and bloody as leaders look to put down to the revolts. Oman is certainly a place to look for this to occur. I've heard that perhaps a move like this may take place in Syria as much of the country is not Islamic yet the government is run by the minority (I don't believe this will happen). As demonstrators have more success, I look for other countries full of disenfranchised youth to try to "Walk Like an Egyptian". I DON'T LIKE YOU BECAUSE YOU'RE DANGEROUS! I found this video today and it captures why Amerika is so great. On a day where the market was down for the first time in 2 months and the Middle East is burning, this is certainly something I needed to make me realize the greatness of the US. Only Americans with all their ingenuity and witty sarcasm could put such a masterpiece together. As I mentioned in the post about Inflation Bombs earlier this week, the seeds we are planting are growing into a nasty fruit called unrest in emerging nations. Yes, there were underlying problems of unemployment, corruption, and horrible governments, but the inflation Ben Bernanke has spewed throughout the world in the form of commodity inflation (FOOD!). Nothing gets a citizen more angry and desperate as starvation and the thought of not being able to afford food for your children. You are willing to die to change drastic situations once your kids can't eat. If you weren't in touch with the severity of the situation you need to be. Egyptians rioted violently and the upheaval has spread to Jordan too. I can't doubt that this will come to Saudi Arabia, Yemen, and other countries. If a large nation-state falls the reigns of power will be taken up by radicals such as those in Syria led by Hezbollah. The danger here is that if this change of control happens in Egypt the world could face serious destabilization in the Suez Canal which is the major oil transport route in the world. Give these guys power over the Canal and you'll make Kim Jong Il look like a child. Still can't believe they didn't use all of my favorite line in this movie - I still can't believe it.
" I gotta give you your dream shot! I'm gonna send you up against the best. You two characters, are going to Top Gun. For five weeks, you'll be flying against the best fighter pilots in the world. You were number two, Cougar was number one. Cougar lost it-turned in his wings." If the US is trying to create inflation (they are) they will print more of their money supply and flood the world with liquidity and excess credit. As banks have excess liquidity through any of the mechanisms that Bernanke has employed the money finds its way to other things. US Central Bankers state that they hope that the liquidity moves from the banks in the form of loans to consumers and businesses. CLEARLY WE KNOW THIS HAS NOT HAPPENED, BUT STAY WITH ME. In theory the consumption of these loans for business investments creates new opportunities and projects that will create jobs, stimulate income growth, get consumers buying, and voila, all is better! Further, while the Fed hopes this is the longer term outcome, they want a quick fix. Alan Greenspan and Ben Bernanke have directly commented that the best way to get a faster recovery is to give the appearance of a healthy economy by lifting stock market index levels. Another way to say this is that they know that if they can pump up stock market valuations they can make consumers feel better (even if things really aren't) and that is about 80% of the battle. Once the economy feels better through "asset price lift" the real economy is sort of dragged along and activity improves. Now don't get all focused on the fact that structural issues haven't changed, remember they are only talking about perception and how appearance becomes real. All of these actions by the Fed are based on the notion that is that "inflation is good" and "deflation is bad". The moves of Bernanke are being made to avoid deflation at all costs. We'll discuss what deflation looks like and why it is bad for the government, the Fed, the banks, and citizens in a future post. Rather than the "expected outcome" we have seen some other results that impact the US and other countries. In a real life scenario we see the pumping of dollars to banks who then have not loaned out their capital. This "unexpected" event has occurred for several reasons including that small businesses just don't want loans because their business outlook is poor, consumers can't qualify for new mortgage loans due to impairments in their properties or lack of income and destroyed personal balance sheets, or frankly banks just don't want to take credit risk and would rather stuff that money in other investments. Notice the last item there. As Ben Bernanke and his FED have printed lots of liquidity and provided it to banks that have nowhere to lend it, they simply have found other assets to buy. As a result of the magical deployment of excess greenbacks we've seen a historic rise in treasuries recently and now we see an amazing run in stock markets and other commodity markets. As we've discussed many times though, the flooding of the markets with dollars does come at a price. The price is that other countries perceive the underlying value of the dollar to be poorer and therefore we see declines in the value of the dollar. To combat this action, banks, hedgefunds, and investors have looked to deploy their investment dollars in assets outside of the US or into assets that are hard in nature such as commodities. As typical with all herds, they tend to over do it. 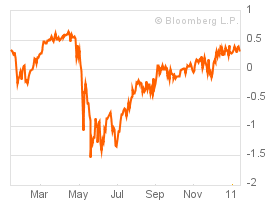 Remember way back in 2008 when oil rocketed to $147? What did we call that despite all of the commodity trading regulators denials? WE CALLED IT SPECULATION! At that time we heard of banks storing oil in barges and tankers off shore and we saw $4 gasoline too. While I have not heard of banks store oil now, they seem to be buying great stuff like cotton, wheat, sugar, and coffee. You know, stuff that is needed for absolutely every other product! We're almost at the point, stay with me. There are two reasons that other countries get really upset about the Fed's master plan to engineer the "recovery" of the US economy through printing and devaluing and making the appearance that all things are better through targeted asset price increases. First, when investors believe that their home currency is going to be devalued they look for other places to send that money to protect their wealth. They do exactly like we suggested over the last year which was to "Go Emerging". I liked this strategy because those countries were growing much faster than the US AND they had a currency that was not the USD. While I'd like to think that many other investors we're as quick to recognize this as I was, it is clear that many came around and flooded those emerging countries with excess capital. These remarkable inflows cause the currency of the emerging country to rocket higher compared to the dollar because there is excess demand. This is a problem because all of these countries are typically big exporters. When their currency goes higher they have to pay wages in their home currency and yet they receive less valuable payment (dollars) or the buyer in a foreign country sees their costs go much higher because it costs more dollars to buy that Brazilian iron ore, Korean television set, or Chinese plastic thingy. So, the increasing value of the currency hurts the emerging countries exporters (which is a huge portion of their economy since they have been built on foreign demand rather than domestic consumption). PROBLEM #2 - FLEEING SPECULATIVE DOLLARS DRIVE ASSET PRICES BEYOND THE EQUILIBRIUM STATE OF THE CURRENCY DECLINE/GAIN. That is a long sub-title there but where I'm getting to is that as more of the herd recognizes that US dollars are being devalued and there is a need to diversify into other assets there is a rush to buy those "hard things". Remember that many commodities are actually priced in US dollars (oil). As we've covered, as the dollar drops there is an adjustment in the price of oil or other goods to compensate for that drop in another currency. The problem with these investors though is that they tend to move the price much more than a 1:1 move to offset the decline in the dollar. The herd of investors may drive oil, cotton, sugar, wheat, corn, etc much farther than what could be expected. The extraordinary moves in commodities, especially foods really hurts those emerging economies where laborers make just a few dollars a day. 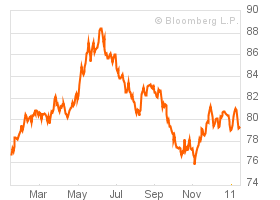 Think about it, sugar is up from its low in May of 2010 more than 100%. Grains too are up 70% or more. If 50% or more of your income goes toward the cost of feeding your family, what is the impact if food costs go up 100% during the year? We are very fortunate in the US because food costs so little relative to our total income. Is it any wonder why I mentioned in the 2011 perspective that inflation concerns, government reaction, and political turmoil would be big issues? When food costs rise dramatically people in those countries riot and seek to overthrow their governments. We don't need to look too hard to find examples such as Tunisia and even Egypt (over the last couple of days). These countries have other issues like high unemployment, but the price of food is often the straw that breaks the proverbial camel's back. ECONOMIC WARFARE - WHAT TO DO WHEN YOU ARE HIT WITH AN INFLATION BOMB? Brazil has described Bernanke's actions as economic war. The overt devaluations of the dollar are hurting their economy and are essentially attacks on their prosperity. What is a country to do in response to these attacks? In response to these attacks, a country can do a few things to attempt to stem the pain associated with the "imported" inflation. Unfortunately, the responses also have consequences. TACTICAL SOLUTIONS WHEN ATTACKED -A country can slap on currency controls that attempt to limit inflows of foreign investment money. In this case non-domestic investors may need to pay a 15% tax on all money that is coming into the country. Countries also may be forced to put taxes or levies on all imported goods to their country because suddenly imports to the country are much cheaper. Emerging governments also try to reduce domestic lending by banks to reign in access to cash that goes toward investments. We've also seen governments in emerging countries attempt to crack down on purchase of commodities as people attempt to trade out of currency and into hard assets, creating shortages. Last, the "responsible" government can increase interest rates in their countries to attempt to head off inflation and crush the "domestic speculation" there. The Bloomberg opinion piece I mentioned above stated that the move to increase interest rates and essentially drive the value of the yuan higher was the prescription for China to head off inflation and justify the imbalance of a currency that is valued too low. But think about it, that move does not happen without serious consequences. Yes, it may stem food inflation costs in local terms, but it most certainly harms their export driven economy by making their manufacturers less competitive and may even drive them out of business. Leaders in these countries are faced with tough choices. Do they endure domestic strife due to rampant inflation for food, or do they crush their exporters making many lose their livelihood? Further, these choices are being thrust upon them by our central bank and the "devalue the dollar" strategy. At some level I'm sure these leaders see this as a death by firing squad or death by electrocution choice. Further, China is facing competition from countries like Vietnam, Malaysia, and Thialand now. No longer is China the cheapest manufacturing country out there. Wage pressures have forced Chinese producers to pay higher wages so industries have searched for even cheaper labor in other places. If China takes the prescription and raises rates and the value of their currency do you think they will lose business to these competing countries? Of course! If you had 100 million or 400 million workers in the exporting industries do you think you'd be quick to make them less competitive? Not a chance. Isn't it interesting that President Hu Jintao of China visited last week? Isn't it odd that he remarked that the US dollar's place of significance in the world is past its time? While the US has the ability to inflict serious pain on the Chinese by pursuing our strategy of a lower dollar and inflating away our debt, the Chinese have significant leverage with us because they own more than 1 Trillion dollars worth of US treasuries and other assets. The timing of President Jintao's visit was not a mistake. At some point our friends and lenders will try to get our attention in a more overt way by shaking up our bond markets and driving interest rates much higher. As our Congressional leadership and our President continue to spend money without restraint and produce huge deficits world investors will shun our treasuries. This action will drive up rates and will also serve to further drive down the value of the dollar. A move like that would create considerable pain for the Chinese, but since the Fed has dethroned them as the largest holder of US Treasury debt, we would hurt even more. (EDIT) - The point I just raised has actually made me think more about what really is going on. We are beholden to our Chinese friends who don't necessarily like holding our debt because the compensation for holding our bonds is mispriced. Here we go again, this is and has been the problem with markets for the last 8 to 10 years in that the reward paid for holding debt is too low for the risk that investors (lenders) are assuming. I'll write more on this, but I couldn't contain my excitement here as I've re-emphasized a common theme I've raised often. A smaller nation doesn't have much leverage against the US right now, but this monetary policy may have greater impact in fostering a much more violent response than we think. Consider that the Fed policy of exporting inflation may drive food prices higher, unemployment rates up, and may even lead to an overthrow of a government in an emerging area. Is it possible that a terrorist faction or a new government blames the US for its problems (that never happens does it?)? Do you think that masses of poor disenfranchised young men might want to lash out as the US for harming their family and their country? Is it as big leap to think that they might act violently and attack in some manner? Of course this is ridiculous, something like this would never happen! While the chance is probably remote and could never, ever happen, the Fed would be wise to review it's Inflation Bomb strategy. We know that the approach taken by Bernanke here is about creating the "quick fix" rather than creating a solid foundation for recovery where structural issues are addressed and cured. We know that Congress (both Dems and Repubs) really has no appetite for cutting spending or fixing our fiscal madness. It is time we recognize the out of control mess that is going on and take action. Cutting $100 million or even $100 billion from our budet is like peeing in the wind. Dramatic cuts in entitlements must be made starting with Social Security, Medicare, and Obamacare and also cutting defense spending. The Fed's monetization is a mirage and farce and is designed to hide the true cost of these programs and is a strategy of extend and pretend that all is ok and recovering. It is time for action and the leadership in Washington (all of them) continue to fail miserably. Unfortunately the policies are failing domestically and also abroad, it is only a matter of time before an Inflation Bomb goes off. The January Update will be a bit abbreviated in the commentary today. I'm slammed working on a few things, but most importantly I want to get this out since we're half way through the month. Nothing new here, total rail traffic is an entire shift higher over 2010 levels. Autos continue to be an area where we must be alert. Shipments are at 2010 levels now and all the "recovery" has not been absorbed. Perhaps the restocking is done and all of those great numbers reported by GM were the normal games played by car makers and dealers. Is it time to short GM? Admittedly, I have already been short GM several times last week. If I have time I'll post a few charts on that stock, it looks like a great set up. Similar to the tonnage of autos, scrap shipping is in decline. The next month seasonally looks like we will have a tick up, if we don't we need to be looking for this to bleed into other areas. In the chart below we see that there are two data points that are lower and only one higher. Let's dig into which is which. First the UCLA Fuel Index (PCI) is reported lower again for November, the Industrial Production numbers too declined, but once again the Dow keeps moving higher. Before we get too worried, the December release of the Fuel Index is significantly higher at a 109 level so the year end surge in Christmas stocking could have done the trick. I'll continue to monitor this. A little move up in CRE transaction pricing. All is good right? The Monster.com Job Index information was released and we continue to see a decline in the number of on-line job offerings. Jobless numbers have been coming in higher than expected so we certainly need to keep an eye out for any continued weakness in the job numbers. Nothing new here, more and more folks coming to our government for assistance with basic needs. For the month of October 300,000 more people were added to the roles. Now it is critical to note that this increase is the lowest monthly percentage increase since February of 2010. Hopefully the rate of change will continue to decline. Not anything unexpected, scrap prices continue higher. 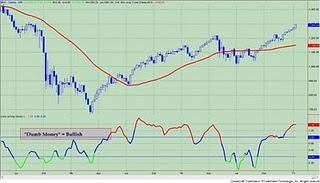 The Coppoock Turn is still signaling a decline and would continue to do so until the DJIA marked 12,350. While this may be a great long term indicator, you'd have missed almost 1,800 Dow points since June of 2010. Now ultimately it may be correct, but I wouldn't hang my performance on this. I'm continuing to post it here just to watch it and see what happens. 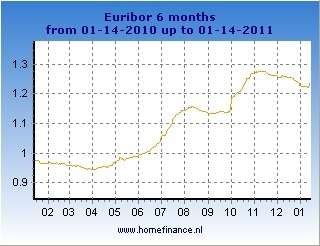 Euribor rates continue to climb - Everything all better in Europe? I think not. The Bloomberg Financial Conditions Index is now fully over zero which signals an expansion. Happy Days Are Here Again! The move over zero indicates that the US economy is in an expansion, not a recession. 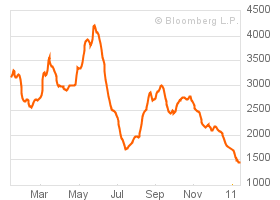 The Baltic Dry Goods Shipping Index continues to move lower. I'm convinced that this is the result of over capacity in the shipping industry. Another thing that comes to mind is that there are rumors that business men and regular folks in China have been hording metals ranging from copper, iron, and more IN THEIR BACKYARDS! I'm suggesting that we may be at the level where speculation has run its course and the BDI could be signaling that there is no real demand.. Of course the floods in Oz can't help as coal and other commodities certainly didn't get put on boats in the last week or so. What's that? The USD is starting to fall again? Who would have thought that might happen? Perceived threats to the Eurozone may have been fixed for another month or so and now we see that the dollar has continued its slide. The market continues to move higher but signs of topping are certainly unfolding. As I mentioned last week in the 2011 Predictions note I fully expect some kind of correction here, but a final move higher into the end of April and May. Having said that, markets do look toppy. Specifically, I remarked above that I had been shorting GM all last week and I'll post the chart here. I didn't annotate it here because there is no reason to. You can clearly see that $39.00 was a point of overhead resistance. This could easily drop to $35 in a simple overall market correction and that is how I've continued to play it. Any move above $39.00 will stop me out. Metals have been weak too as the ECB and Eurozone look to have solved all of their problems......(not). Other than the agriculture areas that I highlighted in the 2011 Outlook, I also said that energy would be a place of great gains. I mentioned XLE, and KOL, but I want you to examine UGA (gasoline). If there is truly a trade for the first half of the year other than the "softs" I think gas is it. I'm not writing about natural gas as I hate the eft for it has been a killer for anyone holding it long term and many of you kow that I am fond of calling UNG the widow-maker I am referring to the gas in your cars. We have punched above old resistance at $40.00 and now I can see UGA move to $52.00 or higher as we get into the summer driving season. Finally, here is another view of UGA as it shows the 14 day EMA and the 40 day EMA. This is a longer term indicator I use to show breakouts and breakdowns. The crossing over of the 14 day EMA on this weekly chart shows that there is a lot of momentum here. (Wish I would have been watching for this back at $36.00). Also the CCI is showing that the trend is absolutely in the bullish camp. A drop below 100 would tell us the momentum is gone. In closing, overall macro trends are mixed, but I think the trader's technical set up is one for a correction. Despite the negative feelings I have, the indices continue to push higher and higher even though individual story stocks are pretty nasty. I made great money shorting last week with a major gain in shorting the rare earth element companies I've mentioned recently. Earnings announcements for the last couple of quarters have been a "sell the news" event, so that too gives me more confidence to be on the short side. Still, blindly shorting will probably yield the same results that we've seen for the last 18 months, so you need to target weakness and sprinkle in a little luck. Perhaps that is what many shorts will receive today as I note that Steve Jobs is taking a leave of absence and the wonder company AAPL is down pretty big in Germany and Europe (market is closed in the US today). This may provide the catalyst for the short term correction I've been looking for in the broader market, but I firmly believe that the dip will be bought and that is what I'll be doing in the areas I identified in the 2011 Outlook. I'll leave you with one other chart here to underscore what I mean when I am looking for a correction. As I noted in last week's outlook several indicators have signaled just how overdone the rally has been without any hint of a reversal. Market breadth, put/call rations, AAII investor sentiment, and more show that bulls are not only complacent, they are outright crazy bullish. Times like these require, no, I mean demand some sort of adjustment to reign in the euphoria. I've often included work from my friend Guy Lerner from http://www.thetechnicaltake.com/ Below is a simple chart that reflects how bullish his investor indicator is (bottom portion of the graph - red line) and how this suggests that we should see a sizeable correction (holding breath waiting now....). Guy's work is always great and I highly recommend his paid site, it provides super information and is really cheap on the wallet. Please read the following CNN story on the increase in CPI recently. I put this story on the blog today with the intent of setting the table for a few follow up posts. I'm still working on my "labor of love" the January Monthly Update. As soon as I'm done I'll put it up. After the monthly update I will put up an article on deflation and then the major piece that I've been threatening to write, the article on the economic war that is brewing. Anyway, the inflation story is one which we MUST pay attention to and one that I've been warning about for a while. The Fed's attempt to indirectly boost asset prices (stock prices) through the buying of treasuries and flooding the banks with cash has created a situation where speculators have taken that liquidity and bought real assets (commodities). Of course these commodities are the raw materials for finished goods, but these commodities are also the foods that we eat. Amerikans are starting to see a bit of the pain of pricing increases, but frankly we are so wealthy we don't notice it much. On the other hand citizens in emerging countries notice the rise in food prices immediately. As I mentioned in the monthly update governments are very concerned about inflation in emerging countries because it results in overthrows of the government (Tunisia should come to mind as an example although the seeds of the revolt were about much more than food ). Ultimately, the Fed's actions are a war on the poor as I've stated many times. Bernanke will continue to drive prices of "assets" higher in the name of getting the consumer back and making us feel wealthier. It's too bad that the casualties will be littered all over the world. I keep getting the sense that something is about to break..... how about you? Please read the following story from Fox News. Examples like these continue to dismay me as I see that the US citizen is a crooked clown that seeks simply to attempt to take money from others and blame them for poor decisions. In this case Nick DeBenedetto seems to be a huckster trying to make a buck. Fortunately the court system has thrown out the case twice, but this certainly calls into question why our government hasn't changed the laws to require that a loser pay for the attorney costs of the winner. These frivolous law suits are cheap to file and don't really have any consequences in our current environment. I would guess that 75% of all court volumes go away if this rule were changed. I hope the attorney representing this guy did it on a contingency basis, he is a crook too. EAST BRUNSWICK, N.J. -- A state appeals court has shot down an appeal by a Tinton Falls man who tried suing Denny's restaurant chain over its sodium content. Nick DeBenedetto, 49, filed a lawsuit claiming the chain wasn't upfront about the high-sodium content of its food. The appeals court upheld a lower court's dismissal of the case. The three-judge appeals panel found that DeBenedetto couldn't prove Denny's had a defective or dangerous product, or that he was harmed. DeBenedetto says he was being treated for hypertension and ate at Denny's about 10 times in the year before he filed the lawsuit. New Jersey Press Media reports that a health, nutrition and food-safety advocacy group represented him in court. Notice that the man ate at Denny's 10 times? Are you kidding me? I bet the same guy ate other places more frequently. Let's look at what food he eats in his own home. What a disgusting joke and a waste of time. What a greedy and dishonest man. 2011 OUTLOOK – A RESURGENT USA OR JUST A LACK OF BETTER ALTERNATIVES? As I started putting together this year’s outlook I’m reminded of the axiom that says that the economy is not the market. What this saying is getting to is that you may have a firm understanding of the components of the broader economy but at the end of the day investors are going to do what they are going to do. Investors may be motivated by seeking opportunities they perceive will be performing in 6 months and therefore front running hot areas, investors may be moving as a herd and bidding up a specific sectors, or investors may be sheltering all of their money in cash-like instruments in total fear like we saw in early 2009. The framework we’ve lived in for almost all of 2010 was one where investors heeded threats and actions by the government to spur the investment markets and they also saw improving fundamentals for corporations. As a result of both of these key variables, investors put money to work and drove the SandP 500 and DJIA up around 11%. As we know, one key factor that helped provide outsized gains is that the Fed helped to engineer a movement of money flows from cash to other assets as it attempted to make safe money worth less and as is the case it typically forced money to seek higher returns as compensation. So, is everything bad in the economy? No! Is everything coming up roses? No! It is clear though that we have more disconnects or divergences in the economy that will be the source for opportunities for gains and tremendous losses in the coming year. As we enter 2011 we must note that there are two distinct worlds within the US economy. We have a corporate environment where big business has outperformed modest expectations and is squeezing more out of less, while we have a consumer world where folks endure actual unemployment or the threat of it, diminished household savings, and little opportunity for income growth. The last two years has destroyed the store of wealth for many Americans as housing values have continued to flounder. It is easy to see why the stock market’s appreciation is important to the Federal Reserve as an increasing market gives us the feeling that our invested wealth is growing which can ease fears. Large corporations obviously had to reduce headcount in the downturn, but have yet to increase their employee rolls significantly. In addition, they have taken the opportunity to raise massive sums of money by issuing debt at historically low interest rates, allowing corporations to have record amounts of cash on the books. This capital will allow them to make acquisitions or endure a downturn that may come. The main challenges I see in 2011 for corporations are that they must get consumers back to their old habits of spending, they must be able to pass on price increases or suffer margin compression, and they must be able to manage government imposition in their industries. Consumers have noticed a slight uptick in their situation of late with an improvement in job opportunities and a reduction in personal debts. The challenge for the average Joe is to keep to his new found religion and somehow continue reign in his pent up desire to spend himself back into debt oblivion. Is the average person back to their 2007 and 2008 way of life? No, not hardly. We have somewhere around 9.5% unemployment with the prospects for these levels to hang around for many more years. According to Fed Chairman Bernanke, these high levels could remain intact for 4 or 5 more years. When he gives us this timeframe he is suggesting it will take that long to get back to an average 5.5% or 6.0% unemployment rate. Finally, Joe-6-Pack must attempt to keep up with the inflation that the Fed Chairman wishes to saddle him with. Of course the worst harmed folks are those that are older and poorer. Those will be the collateral damage from Bernanke’s efforts to spur inflation and resuscitate the financial and banking systems. I know that it is clear that I’m not a fan of the Federal Reserve. I am a big believer in the notion that our central bank is the cause of the wild boom and bust cycles we’ve endured. The Fed’s very nature is corrupt and makes it aligned with interests that are not the same as the interests of the US citizenry. The Fed is supposedly an independent body that works to provide price stability and maximum employment. As you examine the work of the Federal Reserve in the longer term you see that they have delivered very little of either of these goals. Since the crisis in 2008 and 2009 the Fed has uncorked extraordinary measures to save the financial system. Even today in 2011 we see that they labor to provide enormous liquidity to credit markets and prop up asset values. Ben Bernanke and Alan Greenspan have talked at length that the best way to fix the crisis is to increase the perceived values of stocks and bonds. The Fed is prepared to do anything and everything to avoid the grips of deflation as it has manifested itself for the last 20 years in Japan or how it did in our country in the 1930’s. I’ve been a big advocate for emerging markets for the last year and a half. In fact, I still like a few of them, but the truth is that I like less of them every day. Emerging markets have hit the ball out of the park with amazing returns in countries like Singapore, Malaysia, and Chile in recent years, but the stress of all of that growth is bubbling to the surface. Further, the countervailing approach of the US FED is at odds with their interests. I wanted to write a much larger summary of my views of the brewing “economic war” between these countries and the US, but in the interest of getting this document done I will simply suggest that I’ll post this later. Overall there will still be emerging winners, but I choose to reduce exposure from the over-weighted positions I’ve had and move to other areas to capture those better risk-adjusted gains. 1) US MARKETS - Dow / SandP500 +6%. I fully expect that US domestic investment markets will move higher in the year, although I believe that they will fulfill the old adage that you can “Sell in May and Go Away”. I believe that US corporations will continue to post strong financial numbers however they will detail that they do not have the power to raise prices in the current economic environment. They will see margin compression resulting from increasing commodity prices and an inability to charge higher rates to end users will be the reasons for a mid-year end slide in index performance that will be substantial. The US will perform well on a relative basis since we’ll continue to see that other areas in the world are full of their own land mines. Global investors will seek US companies as a safe haven and a relative value trade in comparison to other global opportunities (which I’ll cover below). Large companies which pay dividends and multi-nationals will do better in this environment. 2) JOBS – We will end the year at a 9.0% jobless rate. The increase will be lauded as real improvement, but those out of work will be much poorer. Obama will gain traction in a re-election bid due to the overall improvement in the job market. 3) HOUSING – The housing mess will remain with us. Foreclosure problems will still not be cleared and we will finally begin to see our enforcement bodies begin to prosecute the outright fraud that took place by banks, mortgage companies, and investors. 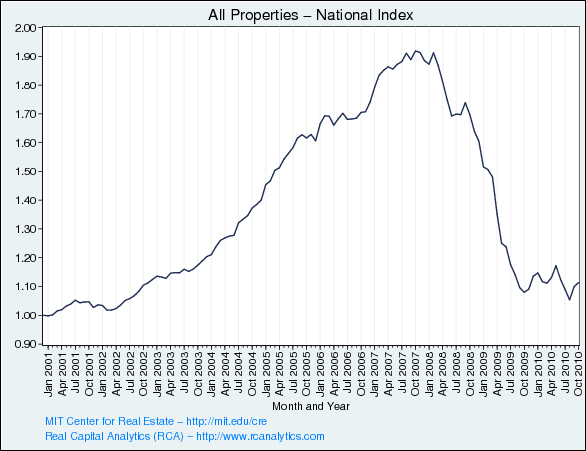 Overall national housing prices will fall another 5% to 10% from year end 2010 levels. The home builders have been destroyed and out of favor for more than 3 years now. Homebuilders may actually be a safe haven as they can be seen as having nothing left to destroy in a downturn in the markets. Finally, the housing markets in China, Canada, and Australia are set for a complete meltdown ala 2008 and 2009 in the USA. I advocate moving out of positions in Australia and Canada if you hold one of those ETFs. 4) USD – The US dollar will continue to fall for the next several months, but as with all of these predictions I suggest that the USD will strengthen against most currencies (Swiss Franc, Euro, and Yen) near the the April and May months. We’ve had a specific theme over the last year where I described the purposeful devaluation of the dollar as a choreographed dance conducted by the Fed. There has been a rhythmic wax and wane in value, but the intent has been to send the value down. The willful destruction of the dollar’s value is a by-product of the printing and easing employed to boost asset prices. Trouble in Europe and in emerging countries will over-ride the Fed’s artfully controlled slide of the dollar. 5) INTEREST RATES – Higher then lower, then a move higher. All of that to say that we end up exactly back to these levels at year end on the 10 Yr, let’s call it 3.5% to 3.75% which is about 40bps higher than today. 6) OIL - $105 to $110 will be the high for the year with a drop to the high $70’s or $80’s in the following correction. Energy etfs like XLE and KOL will be a good target for this early run but timing an exit is critical. 7) WHEAT, GRAINS, CORN, HOGS, CATTLE, AND SUGAR – Like oil, I predict a big ramp higher in the short run. Unlike oil though, we’ll see a less significant correction here. This area is still a long term buy based on consumption and demographics in emerging countries. There is no way to keep the new middle class in India, China, and other emergent countries from eating more meat, grains and sugar. Increased demand will force higher prices. Isn't great we still have all of those cool ethanol subsidies to ensure that farmers grow all that corn for a wasteful non-green green energy? The point here is that the ethanol mandate contributes to the consumption of farmland that could actually be used for food rather than an inefficient fuel. Those politicians sure did get the message didn't they? 8) GOLD AND SILVER – As much as I love gold and silver I believe that we’ll see the blow off top run here in the next few months. I think silver easily gets to $35 and gold could hit $1,500. I am prepared to sell my positions in both and even my physical metals that I have in the safe-deposit box. I fully realize that if a Euro collapse does hit then there will be a total parabolic blow off beyond anything we can really grasp. At that point silver would likely be $100 and oz and gold near $3,000 or more. While I calculate that part of the reason that commodities will fall will be more significant issues in Europe in April and early May, I reason that another stick save will be provided by the ECB, IMF, and US FED. Could this happen? Yes, of course, this is why I posted the video below because if views like these become more prevalent then we could see a country like Italy or Ireland doing what they should do (default) rather than chaining their citizens to unpayable debt and a life of financial slavery. Again, gold has traded as its own currency and stress in Euroland makes gold more valuable. EDIT - 1/14/2011 - Just to be clear, I still think gold and silver run higher, but then fall back in the same pattern as the overall market and commodities like oil. Therefore, this is why I'm prepared to sell as the blow off top pushes the metals to euphoric highs. I just wanted to make this clear since I got a few emails asking me why I'd sell if they really did move that high. I don't expect that "sugar high" to last....(actually I do expect sugar to go nuts and stay high for a while, just not the shiny metals on a sugar high). 9) COPPER – Emerging market central bank’s efforts to combat inflation will work this year to make copper a loser in this battle. While we’ll see the same type of action I’ve described above, but copper will be impacted more and we could see copper in negative territory for the year despite an early move higher. 10) BANKS – The steep yield curve benefits banks and I look for the biggest beneficiary in this environment to be the regional players like Regions and Zions Bank. These will become M and A targets and they have already largely dealt with their real estate messes on balance sheets because regulators forced them to. Big money center banks will still do fine, but not as well. While we’d all like reality to come home to roost for the JPMorgan, Bank of America, and Wells Fargos, the fraudclosure mess won’t impact them, no matter how disturbing the news is regarding the way they sold and securitized loans I’m afraid this will be a big nothing-burger. Last, it is clear that the “Fed has their back” so if things were to somehow implode we know that there is a backstop out there called the US Taxpayer and he has a bottomless pocket to save all financial institutions. XLFit and KRE are +8% at least. 11) MUNICIPAL BONDS– We’ll see continued pressure on many municipalities as they will need to face the stark reality of their budget crisis. There will be opportunities to buy municipals to capture outsized gains but don’t be fooled, there are real risks and we will see municipal defaults. Typically this has not been common, but the problems with underfunded pensions and poorly negotiated contracts will force city and state leaders to do what they need to do and default. Personally, I’d avoid them since most munis are long dated and you are taking serious interest rate risk on top of the credit risk of municipal institutions that are run by political hacks. 12) CORPORATE BONDS – Wait for commodity and market ramp. That move higher will continue to push corporate bond prices lower and finally put them in an pricing area where they again become interesting. Please note that I usually target buying corporate bonds that are less than 7 years in maturity. I do not subscribe to the hyper-inflation theories and therefore I do believe that a chance to buy solid company bonds yielding a 6%, 7%, or 8% rate will be great. (No, I haven’t seen these yet, but I expect good opportunities). I look to add to bond positions in April and May near the height of the commodity and equity euphoria. HEALTHCARE REPEAL – FAILURE - Republicans have no stroke and can’t repeal the beast. They may be able to starve some provisions of the reform and hold it hostage, but frankly I don’t believe that they are truly committed to anything like that. The Tea Party will be angered as they realize they have been co-opted and the RNC leadership simply adopted their speech and changed nothing. 2011 will open the way for new “radical” independents that will further sweep out Democrats AND Republicans that will all be seen as tools of industry and fixtures of the political class. After two years in office Obama’s Utopian ideals and naive hopes should now be completely dashed. If he hasn’t realized that there are really bad people on earth that should not exist; he clearly is not a smart guy. Obama’s new approach to Gitmo does make me somewhat hopeful that he is beginning to get it as we have not heard much more about Gitmo other than it isn’t going to close. His stupid and uninformed criticism of Bush’s approach to the problem of detainees during his election campaign has clearly revealed itself to be without merit. Obama’s worldview that the USA is bad and should apologize for ever coming to the Middle East or interacting within that society is ultimately one that positions our country in weakness. One cannot change what has happened in the past and likewise our very presence in that portion of the world has brought light and the idea of liberty to people in darkness. This issue (Gitmo) will be a huge issue with left leaning folks that will be absolutely disappointed with Obama’s broken promise. Don’t Ask Don’t Tell Reform in this lame duck session was an attempt to appease this faction for the Gitmo miss-step. RISE OF CHINA AND RUSSIA – REALIZATION OF THE TRUE NATURE OF OUR ENEMIES – Use of 3rd Party proxies will increase and further illustrate the impotence of the US in global theaters and the strategic failure of our military and politicians to realize the coordinated global threat that these two powers represent. North Korea, Iran, and Venezuela will continue to be thorns in our side and the two Communist powers (Yes, Russia is still run by these goons – they just call themselves different names) will ensure that the USA is entangled in skirmishes and wars that will bleed us to death (in terms of soldiers and financially). Note that these attacks will be in the form of military confrontations, digital attacks, and even economic sabotage. There you have it. Up, then down, and slight up again is the direction I see things. Volatility will be the name of the game and the theme will be that everywhere else in the world is laden with risk, so US and global investors will fall in love again with US stocks more as relative value and relative risk trades. The drum beat of financial war will increase in intensity as the US attempts to devalue its currency therefore strangling emerging countries that are dependent on exporting. Other than China, these protests from the likes of Thailand, Brazil, and Chile will fall on deaf ears. Foreign central banks are in a tough position as they try to balance strong growth against killer inflation. Unlike in the USA, these countries citizens actually riot and remove governments when their central banks screw up. So, the stakes are high for these nations and the inflation monster is real and scary. As we continue to pressure them with attempts to devalue the dollar we will see more outrage and attempts to control capital inflows into their countries. Chinese and Indian leaders will try to slow their economies to combat out of control inflation but I do not see them able to slow their markets in a gentle fashion. These efforts will lead to abrupt corrections in those emerging countries and this will have serious negative repercussion in commodity markets. Europe is still the overhanging wild card. Let me highlight, it isn’t the unknown that the current format of EU will collapse and the Euro will be destroyed, it is more about the timing. The revolving door of “who’s imploding” will continue until one smart player finally opts out and outright defaults. Once they default they will essentially quit the EU and the Euro and resume their own currency. This will be a scary and tough time for the world and for that brave country, but that country will emerge stronger and more capable due to the shedding of the mess of their own making. If this event happens in 2011 then the gold and silver trades I mentioned will happen and a parabolic spike will occur. I don’t believe it will happen this year and this is why I have only mentioned it. Until that time we’ll see Portugal, Spain, and Italy come under attack from bond traders and more bailouts will be a certainty. Riots will also come with the deals to “save” the countries and “bail” them out. Finally, don’t assume because I’m suggesting the US stocks will outperform others that I believe we have a healthy market. I am not saying that at all. In fact, I think we are over-valued from a historical perspective at this moment using the lens of the Shiller SandP P/E ratio model, AAII Investor Sentiment, and Put/Call ratio. In addition, we have tremendous structural issues related to government overspending and a scary Federal Reserve that has tremendous interest rate risk on its balance sheet. Despite those concerns I don’t think that they will impact the overall outcome this year. Having typed all of this I know the moment that I publish it, we'll slam down 3% to 5% simply because the market is over-bought! The message here is that despite a coming dip we'll see buyers come in an thrust this market higher through April or May. These are just overall market ideas and my thoughts organized to give me a framework and benchmarks to note as we move through the year. Please share your thoughts and give me your predictions. Just an update. The outlook for 2011 continues to grow and has morphed from a simple bullet point list into something more. I'm trying to hurry, but want to ensure I describe where and why we're going to be where we are going. The January trading update is also not far behind. Have a great week and be careful! Just wanted to post this picture and follow up from the other day's post on the rare earth gravy train. Unlike what our government has tried to make us believe, parabolic moves upward often end up rather nasty. Perhaps this move in the rare earths has some predictive powers on what the broader market might see in the back half of 2011. I'm pretty sure that I'd be short MCP here now that a sell off has begun. Now hear me clearly, this may come back to the high thirties and stabilize which frankly would be good for the stock and those that are shorting. I think I agree with the perspective that rare earth miners could do well for the next year or two, but a 100% move on no real performance? Remember, MCP is valued at $5 Billion and has $15 million in annual revenues......... not typically the type of valuation that is deserved. RARE EARTH? HYPE OR THE REAL DEAL? I haven't received any emails about these yet, but I fully expect to start getting them if MCP rips off another monster day. I watch about six or seven of these firms daily including a few of the ETFs that have recently been released. I have not held a position in these, and don't really intend to as of this writing. Yes, the rare earth metals firms are shooting higher, but that doesn't mean that we need to board that train. Especially don't pull the trigger and buy MCP! Look at its revenues! Look at its market cap! This company is now valued at $5 Billion and has revenues as of September 2010 quarter end of $15 million! While it isn't quite Facebook, it certainly is an internet valuation. Ok, enough said, do your own homework, but I find it very hard to believe that that is the best choice out there. Could rare earth miners be a good investment? Yes---- last month and last year. I'm not so sure about two years from now. Flip through these slides for a little more information. Essentially what they are saying is that China has a monopoly on these now, but longer term prices will come down as their grip on supply will lessen.